Since his childhood in the DeepWoods, young Twig has always longed to soar above the forest canopy and explore the sky. 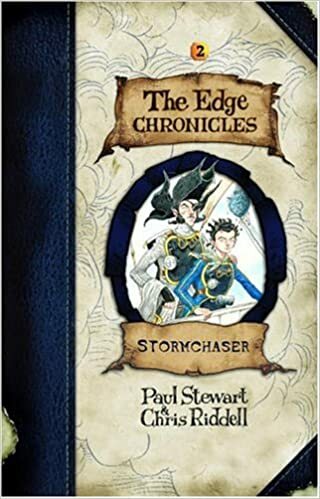 Now a crew member on his father’s sky pirate ship, the Stormchaser, his dream seems fulfilled. But a much higher destiny awaits Twig. The lofty city of Sanctaphrax—built on a giant rock, floating high in the sky—is at the point of disaster. The city’s future is dependent on stormphrax—a valuable substance available only from the heart of a Great Storm. And only the Stormchaser, with Twig onboard, could risk entering a storm. . . .
fetch the animal-quack,’ he muttered. ‘Get it stitched up again.’ He looked at Twig, as if seeing him for the first time. ‘Are you trustworthy?’ he asked. Twig nodded. ‘Hmm,’ Flabsweat mumbled. ‘Well, since you’re still here, would you mind watching the shop while I’m gone? There could be something in it for you.’ ‘That’s fine,’ said Twig, trying not to sound too eager. The moment Flabsweat was out of earshot, the eater-bird immediately asked once more to be set free. But Twig was adamant.